If you look at the discards out by the curb on trash pick-up day, you’ve probably noticed broken wooden chairs and stools awaiting their one-way trip to the municipal landfill. It’s a shame how frequent this sight is, since in many cases a simple, basic repair could put these items back in service for many years. In this Hub, I’ll show you how to do the most common repair, which is the replacement of a broken brace. Busted! This chair needs a brace. Most wooden chairs, and nearly all bar stools, have legs which are connected by braces to form a rigid structure strong enough to support us safely. These braces are vulnerable—they are exposed to all sorts of accidental impacts, and it’s easy for people to put their full weight on them. They are not designed to withstand that! But if a brace does break, the legs will soon follow suit unless the brace is repaired or replaced--the legs by themselves are not strong enough, nor rigid enough, to withstand sideways stress. Without the brace, sideways stress on the free leg has split it at the top. 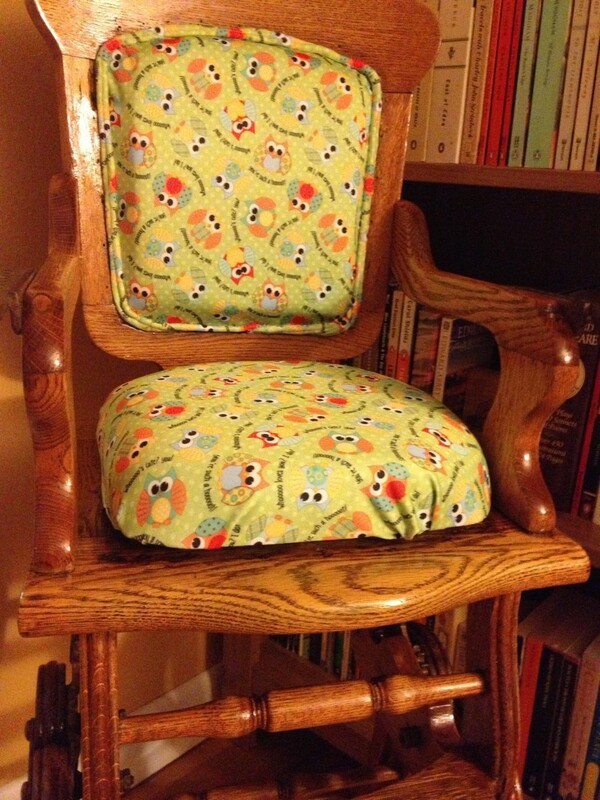 Similarly this chair. This joint was reglued. 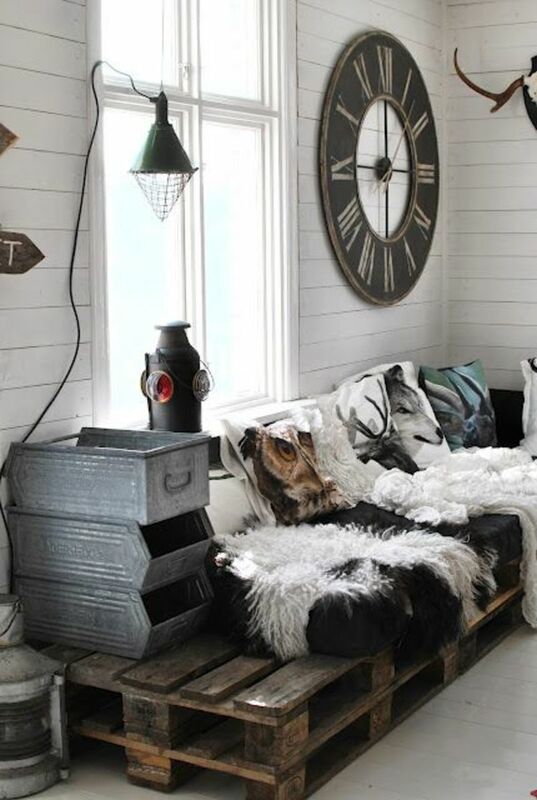 The chairs illustrated in this Hub are particularly easy, for a couple of reasons. (I've fixed two of them now.) 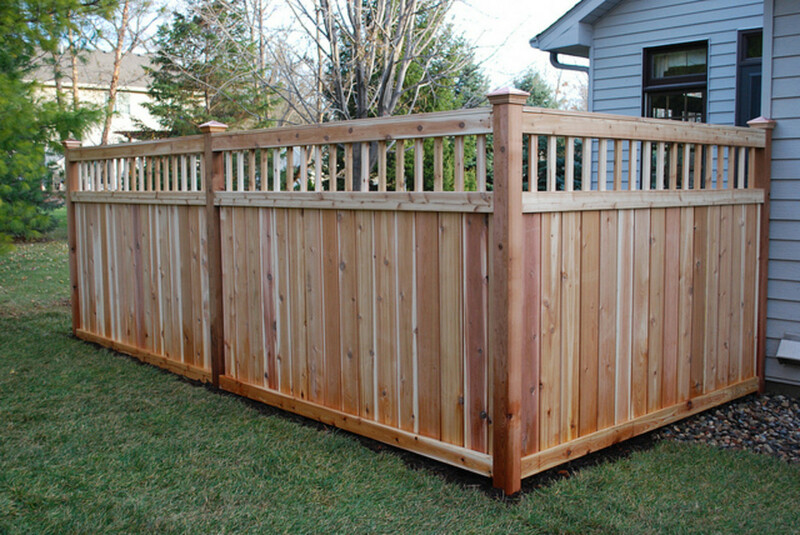 First, the braces are simple, plain wooden bars which are easily replicated by the home handyman. 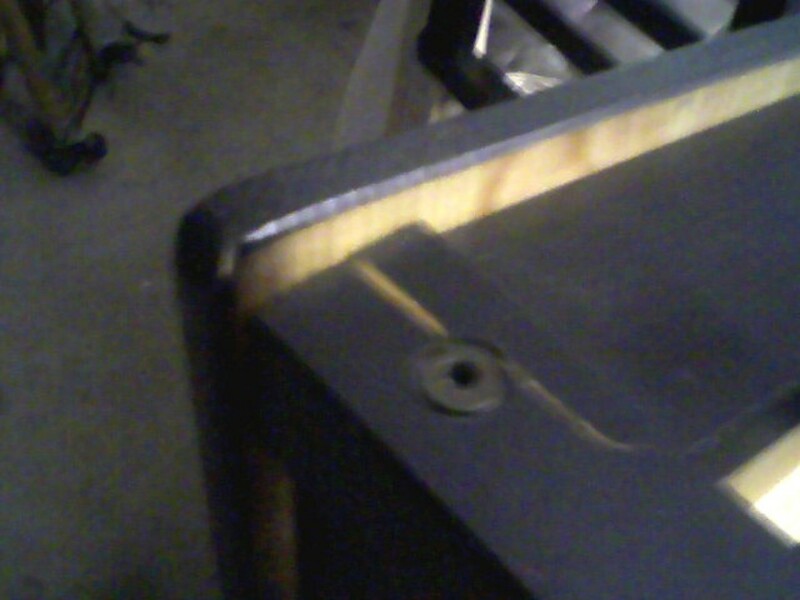 The finish helps, too; the black paint is easy to match and covers up wood filler and screw heads admirably. Conversely, ‘spindle’ braces need a wood lathe to duplicate, and stain finishes can be harder to match, as well as requiring more refined woodworking to achieve 'invisible' joinery. 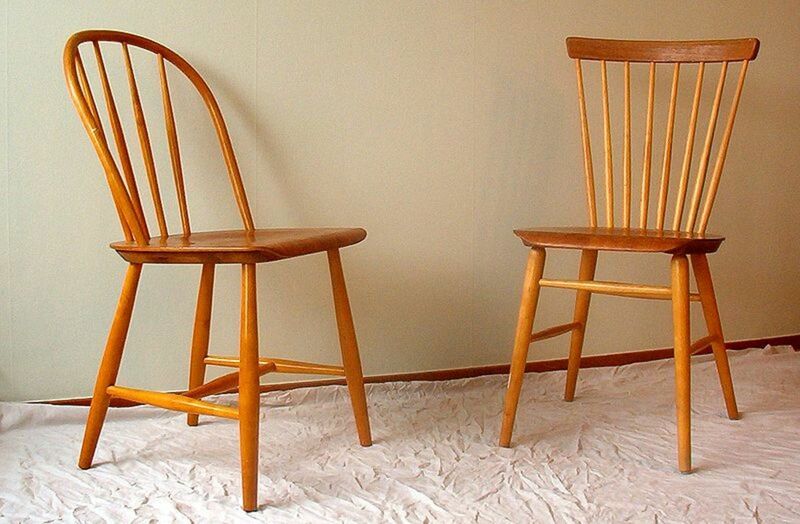 Even these relatively clean-lined and simple Swedish Windsor chairs would be harder to repair. Image courtesy Wikimedia Commons. Begin by removing the remains of the old brace. In this case, simply sawing them off flush with the leg was sufficient. 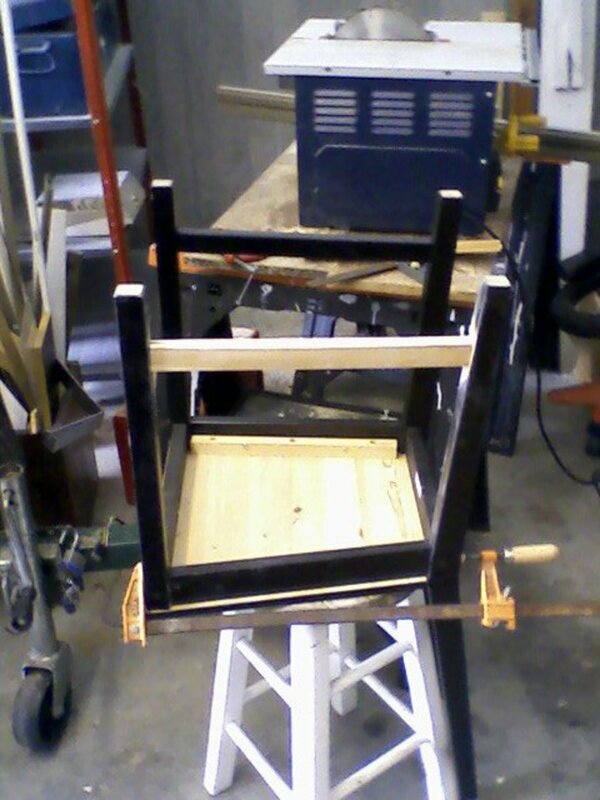 I had decided that for such a utilitarian chair there was no need to attempt an exact repair, which would involve crafting a brace with peg ends to insert into the legs. 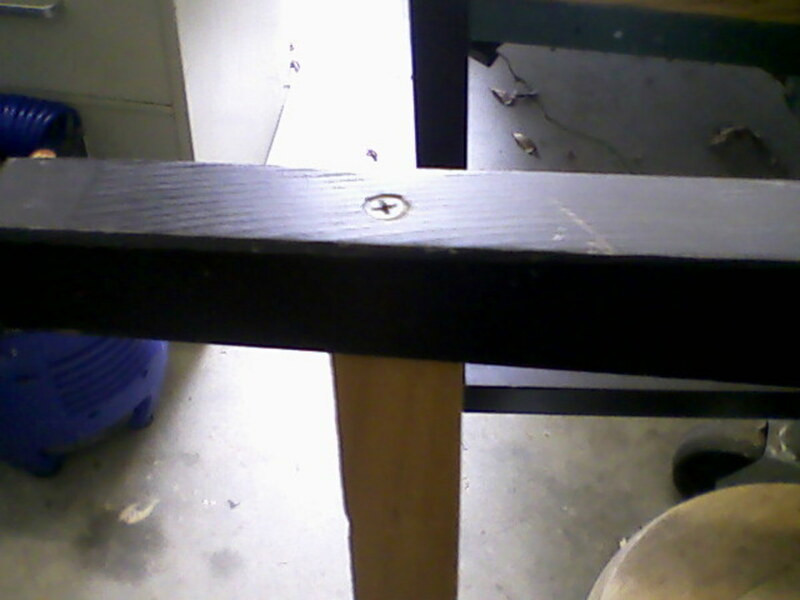 Rather, I planned to use deck screws to make a simple yet strong joint. Closeup of sawn brace end at leg. 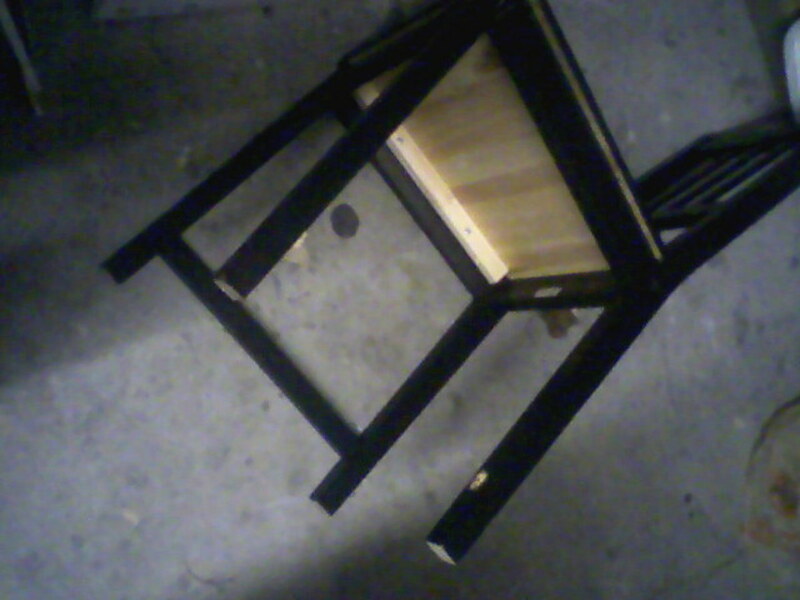 Unfortunately, the chair had been used for some time after the brace broke, so the leg itself was also damaged, as shown earlier. 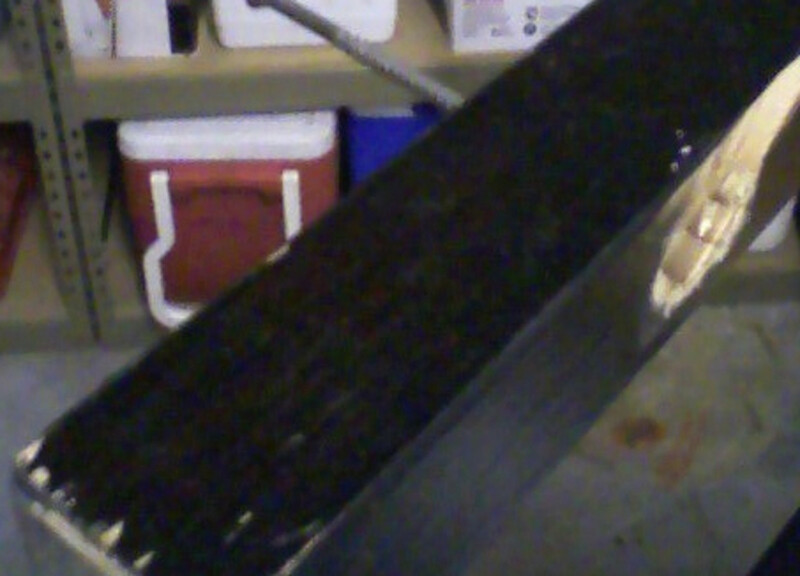 This damage was addressed by gluing the split wood at the top of the leg. I used a good woodworker’s glue, fitting the damaged areas carefully back together and clamping the leg back in the correct position. 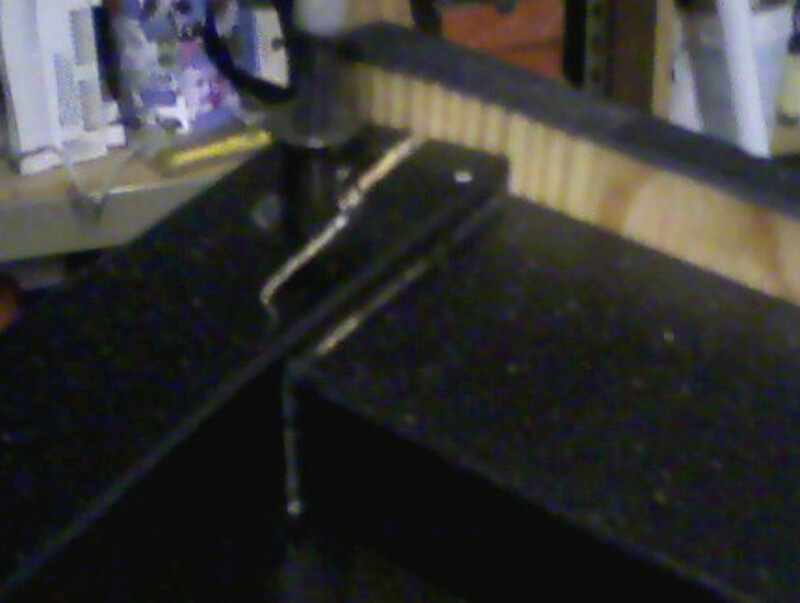 Glued portion of chair leg. The next step was to make the replacement brace. I used a scrap piece of pine, already the correct width and thickness. The undamaged brace on the other side of the chair provided a handy template, allowing me to simply trace the necessary cut lines for correct length and angles for the ends. No measuring required! 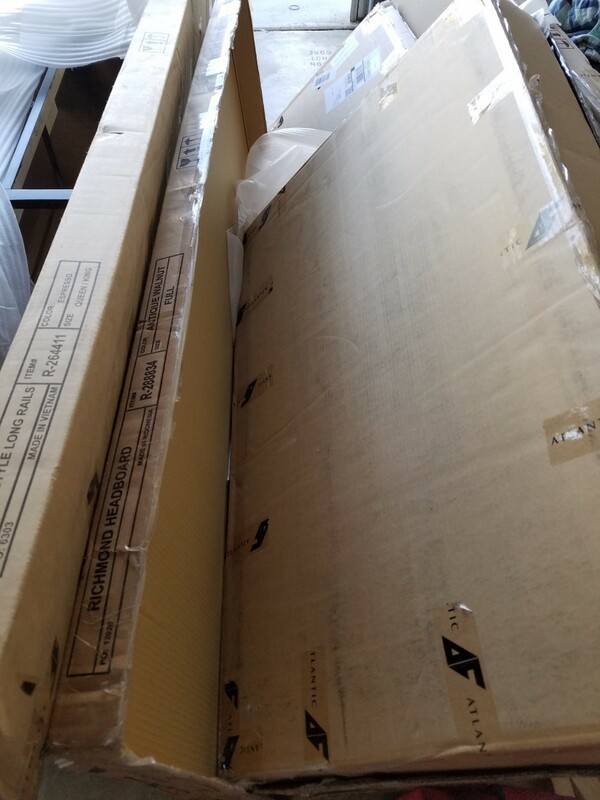 Replacement piece, cut to length and ready to go. With the brace cut to size—and the glue on the leg repair fully cured, of course!—you are ready to proceed with installation of the new brace. 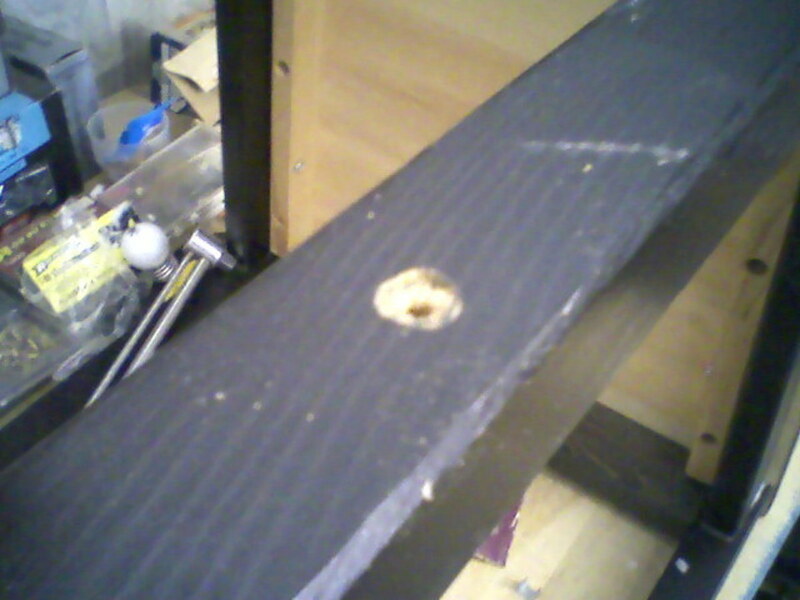 Start by drilling pilot holes for the screws. It’s best to drill from the inside of the leg out. That lets you accurately match the location of the holes in leg and brace, even if you drill the hole in the leg at an angle that's less than perpendicular—and if you don’t match those holes, the brace won’t be centered in the leg. Drilling a pilot hole from the inside surface out. Screw roughly fit into the leg. 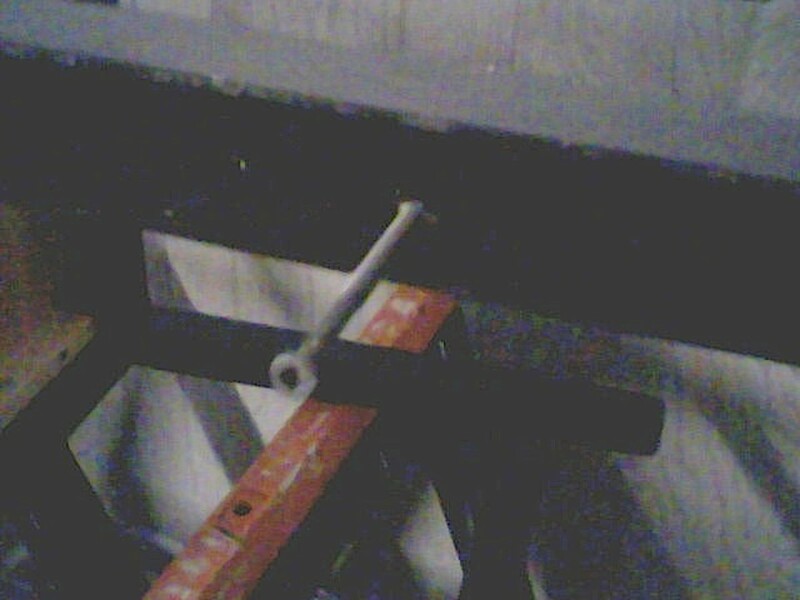 I haven't yet countersunk this surface--though I should have, as now the screw will have to be completely removed to countersink! You may also wish to ‘countersink’ the screws in the legs. 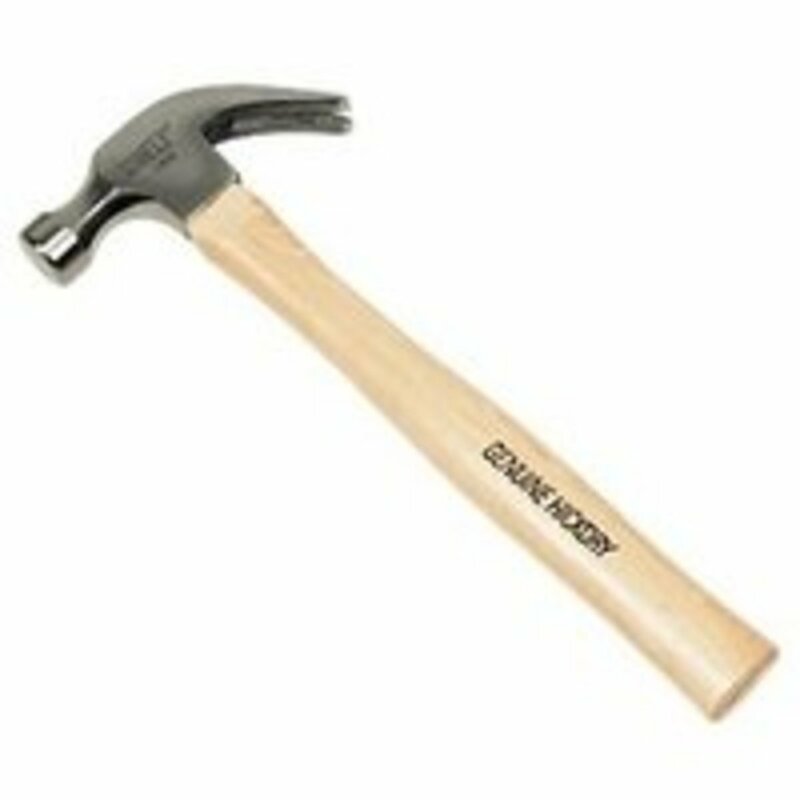 If you countersink them deeply, so that the screw heads are, say, a quarter-inch or more below the surface of the leg, you can fill the hole with wood filler. When sanded and painted, this is basically an invisible repair. In the case of this basic utilitarian chair, I was content to countersink so that the head of the screw was flush with the surface and simply paint the screw head. 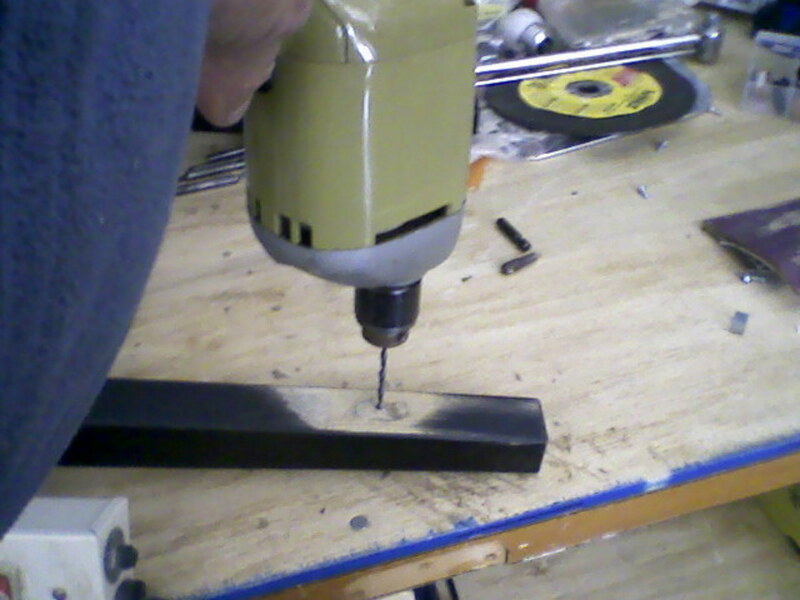 Checking the diameter of the drill bit before countersinking. 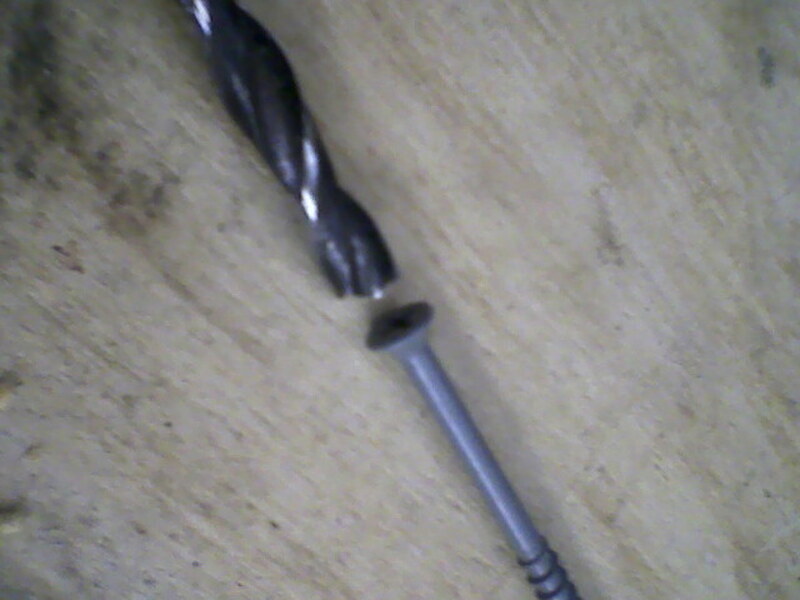 No style points for you if you countersink simply by overtightening the screw so that it digs itself into the wood! 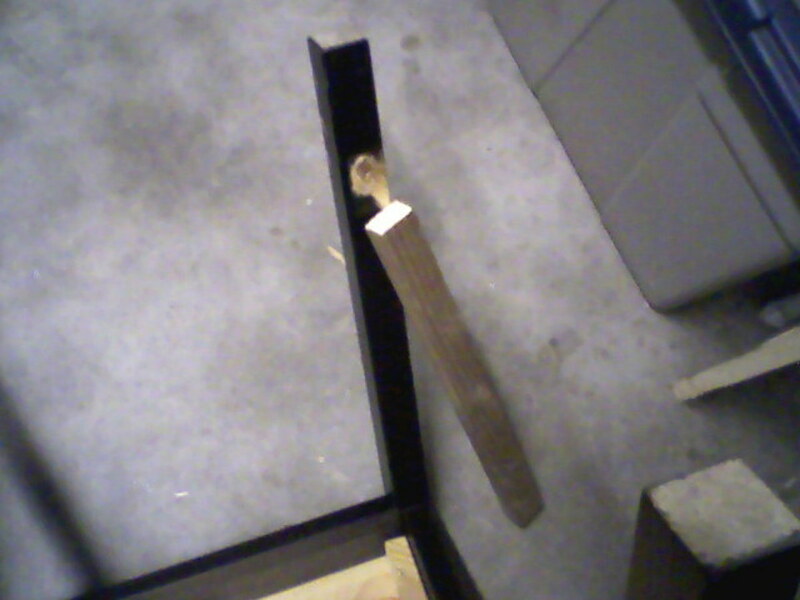 This tactic can work if the wood is soft enough, but runs the risk of splitting the wood, or of stripping the hole so that the screw threads no longer hold. Trust me on that! 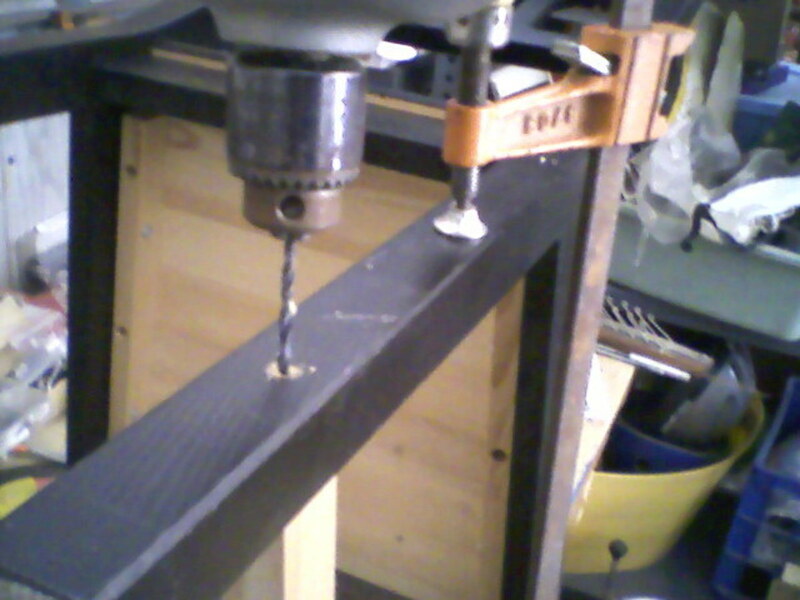 Drilling back into brace end. 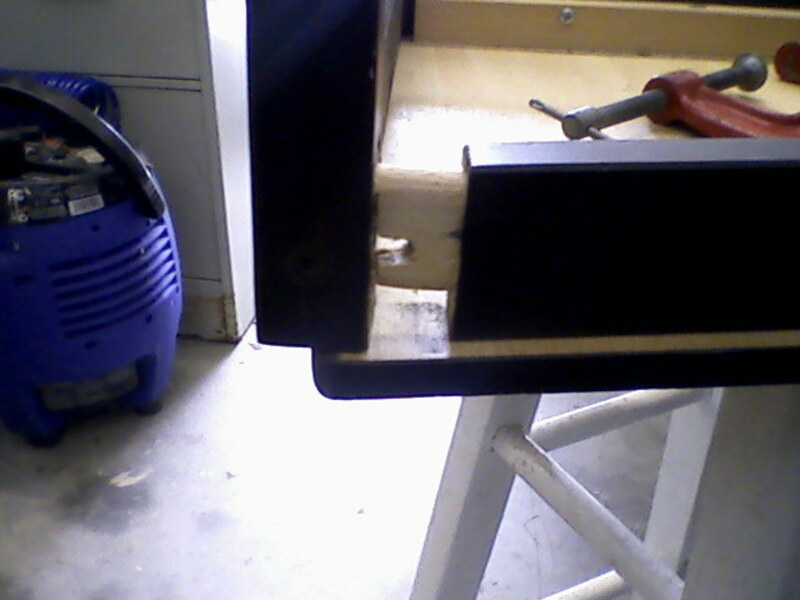 Note use of bar clamp to help secure the brace for drilling. Be careful that the brace is solidly against the leg as you screw the joint together. 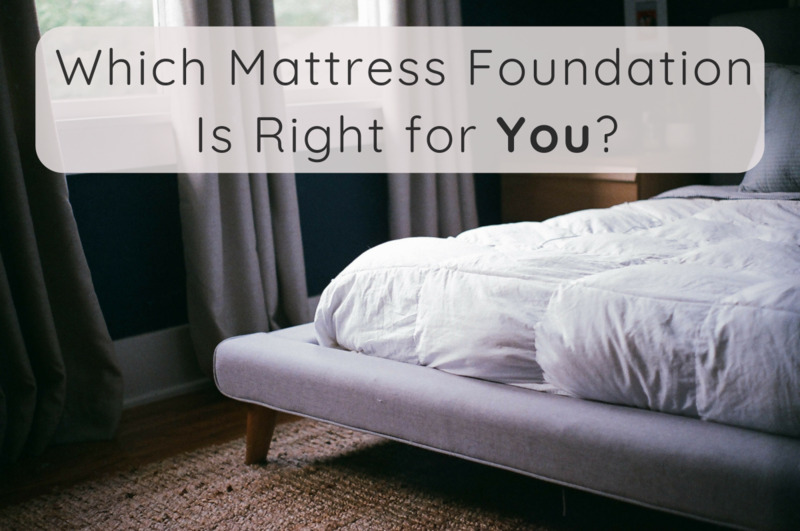 You don’t want any gap between the two pieces, as it will compromise both appearance and strength. 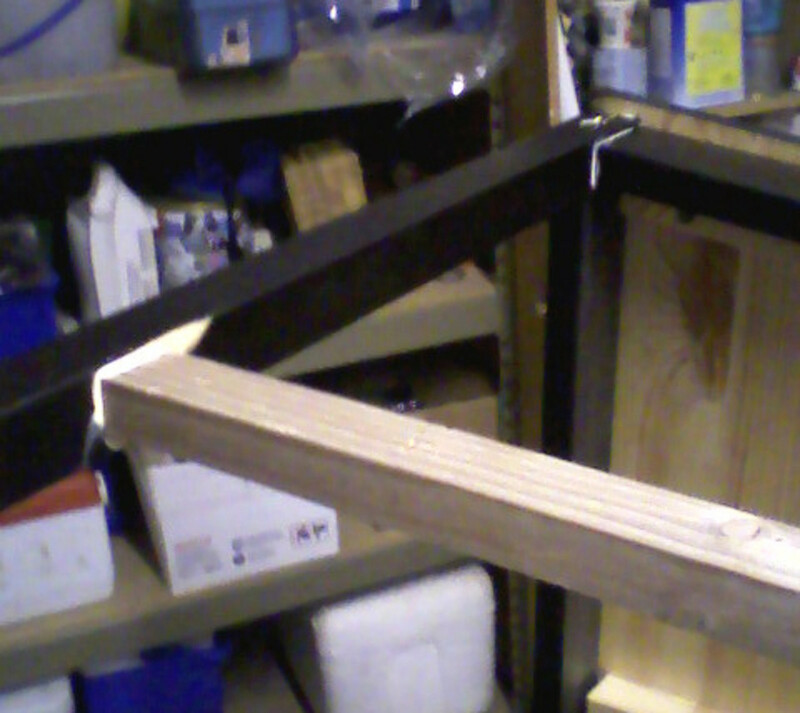 I like to add a little supplementary strength to the joint by gluing. I really don’t think it contributes all that much--but the glue should help keep the brace from rotating, and requires nearly no additional effort or expense. So why not? New unpainted brace in place. And it's not as if you have to tell everybody just how easy it was! You are welcome, shannon! Thanks for taking a moment to comment. You're welcome Doc Snow. No worries. Great hub on how to fix wooden chairs and stools and how to not to fix them. This is very detailed with the photos in easy steps to do at home. Hey, thanks! Hope it's helpful. And good luck with the repairs! I really needed this! I have a few chairs that I need to fix which I bought off Craigslist a while ago. the previous owner did a shoddy job of trying to "fix" them, so now that I have the time I have been looking for the way to do it properly...I really like these chairs but they are so unstable right now because of the bad repair work! I'll definitely be coming back to this tutorial in a few days when I fix mine! Thank you! Thanks, Lyn. I so relate to that comment! I take a cue from that and reuse our printer paper for note paper by writing on the back, and by making firestarters for our wood stove. (I also reuse household grease of all sorts for this application.) Yet that doesn't come close to accounting for all the paper we throw in the recycle bin. Love it thank you ... 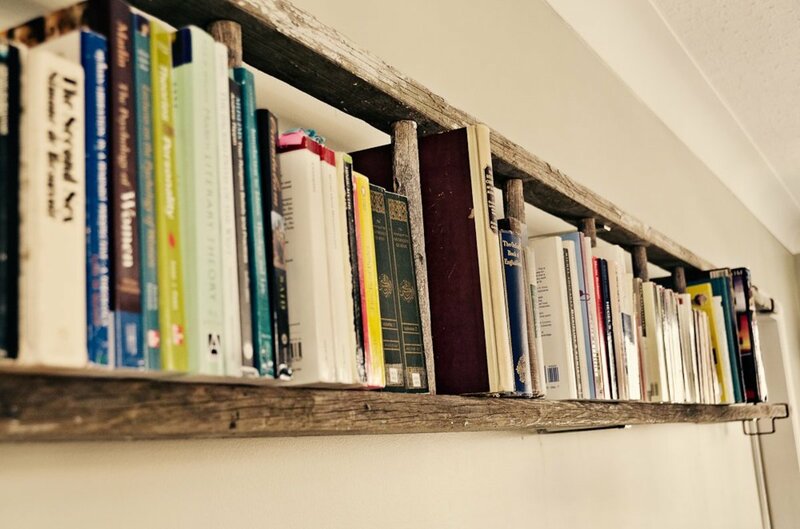 I like learning how to fix things that others throw away. perhaps because it is all I can normally afford to do. Thanks, webreview! I'm pleased to "meet" you, and look forward to reading your Hubs, too! Great Hub! I love how you used pictures to explain how to fix a chair. Very well done! Thanks in turn, "Hello!" You are always such a gracious Hubber! 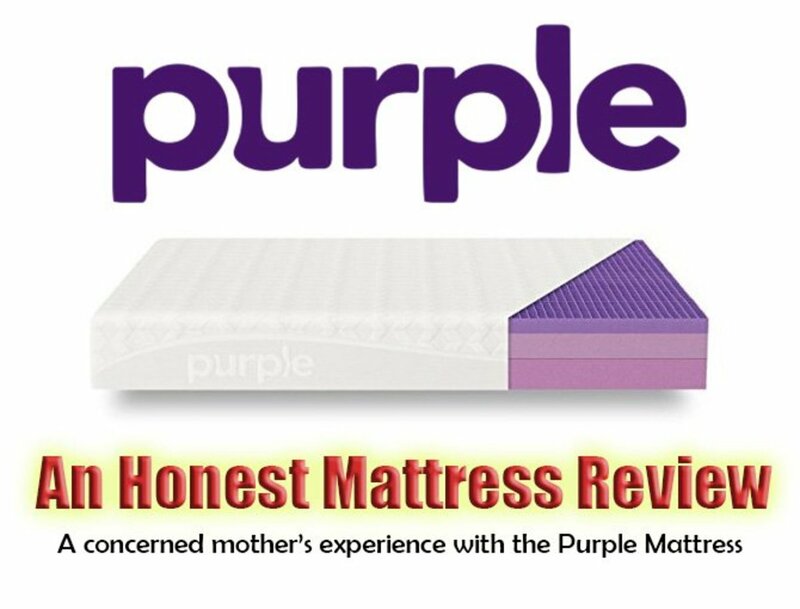 A very helpful and informaive hub. Thank you. crysotolite, thanks for dropping by to check this Hub out! I appreciate the kind words. i actually liked this post!! very well written and very informative. keep up the good work. Nice pic posted here.